In my post, Homemade Soapy Goodness from 2014, I talked about how I found some soap that I loved. I loved it so much I was asking for it as gifts. My hubby would say, “What do you want for Christmas/your birthday/our anniversary?” And I would reply, “Soap.” In 2015 when I went to order more soap, I could no longer find the soap lady. Her Etsy landing page is still up, but I can’t find that she makes soap any longer. I did receive some soap from a friend and I loved it so much that I started buying it. But it went from $4.00/$5.00 a bar to $8.00 a bar – not including shipping. So I decided I needed to find a new soap to use. I was just making do with some other kind I had found that was kind of drying, but it was ok. Since I am always on the hunt for some great soap, my hubby and I usually buy a bar or two from the vendors at any Art and Wine Festival we go to. Which is funny because we don’t go to many. We have been going to one – the Milpitas one – for the past two years. It also funny because the first year, I didn’t buy any. 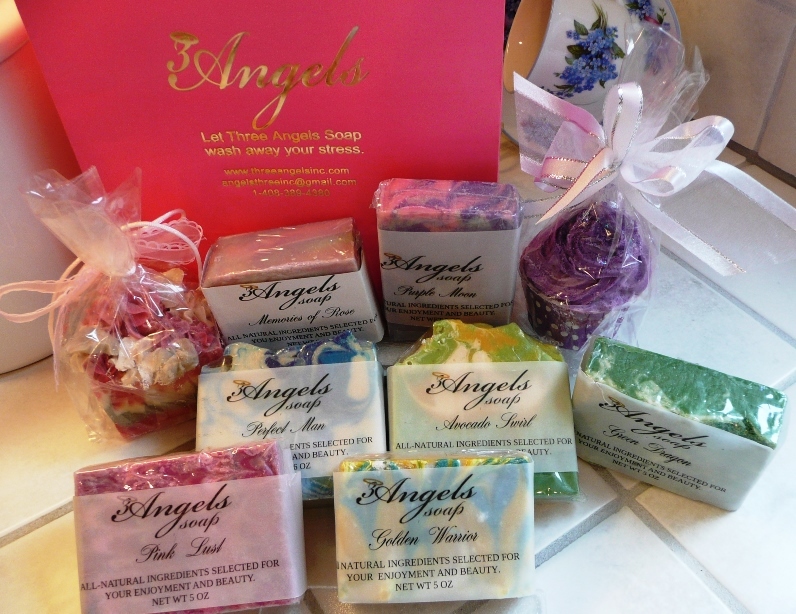 Well, this year we bought some soap from Three Angels Soap – again. I say again because the first time we went to the festival (August 2015), I didn’t buy a bar of soap from her but my hubby did. I do remember a period of time when I kept asking my husband, “What are you using in your bathroom? Are you using a new hair product? Are you using a new soap?” And he didn’t know what I was talking about, but every time I walked into the bathroom it smelled awesome. He was using something that made the entire bathroom smell really nice. Then after the second time we went to the Milpitas festival we both bought some soap. When I used it the whole bathroom smelled great. That is when I realized that it had to be this soap that my hubby had used and that had made his bathroom smell so great. I love this soap. I have tried three kinds so far Memories of Rose, Purple Moon, and Lavender Swirl. They all smell GREAT! Lavender Swirl does not lather up as much as the other two. It also does not make my bathroom smell as good as the other two. I really liked Purple Moon. It lathered up great and made my bathroom smell awesome. I also really like the way it make the skin of my face look and feel. But so far my favorite is Memories of Rose. It lathers up great, makes my bathroom smell great and I love the way it moisturized my skin! As you can see from the picture I have a few. Some of these are mine and some of them are gifts. Don’t you think the one that looks like a chunk of cake with frosting flowers on top is a nice gift? What about the cupcake? I have not even tried all the scents that I am gifting because I know they will be awesome. The ingredients include: Olive oil, Cocoa Butter, Mango Butter, Buttermilk, Greek Yogurt, Coconut Oil, Avocado Puree, Confectionery Sugar, Goat Milk, Palm kernel oil, Aloe vera, just to name a few. (Not all of these are in one soap, I was just listing some of the ingredients in several soaps). So . . . YAY! I found some new soap to love! 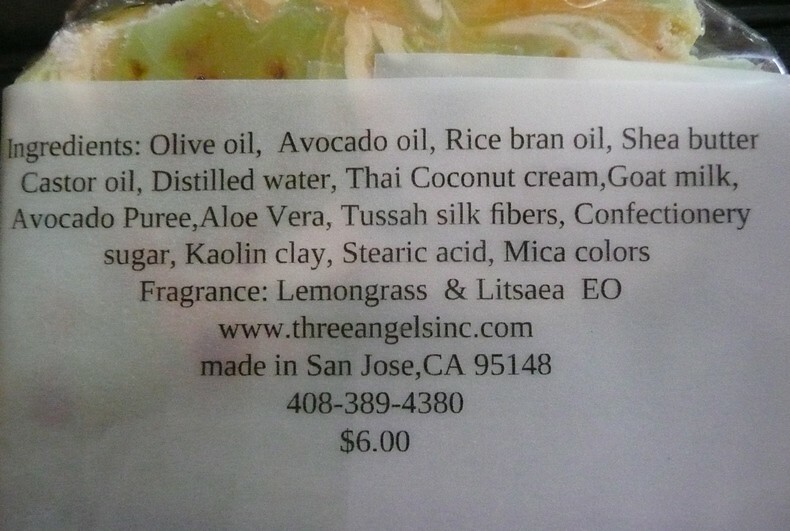 I hope that you will give Three Angels Inc. a try when you want to treat yourself to some luxurious soap. Or you want to treat someone else to so luxurious soap. Give her a call or check out her website! Do you have a favorite soap?